The work of Heritage for Peace is highlighted by the Wall Street Journal (February 11 2015) under the title ‘Culture Brigade: Syrian ‘Monuments Men’ Race to Protect Antiquities as Looting Bankrolls Terror’. The article discusses training provided to Syrian archaeologists by H4P and the work of those archaeologists within the country to catalogue damage and protect Syria’s heritage. Franklin Lamb’s piece for Counterpunch, ‘Can Syria’s Cultural Heritage be a Fulcrum for Ending its Civil War?’ (February 9) also features H4P. On February 20, senior staff of Heritage for Peace will attend a seminar in Barcelona entitled ‘El Patrimonio Cultural en tiempos de conflictos’. Heritage for Peace collaborated in the organisation of this event. See here for more information, and for the program (in pdf) see here. Heritage for Peace participated in the conference concerning the Reconstruction of Aleppo in Berlin on the 6th of February. See more information here. Video by Ismael Abed Alrahman shows damage to Al-Serwi/Al-Sarwy mosque, Albayda, Aleppo, shared by Protect Syrian Archaeology (February 15 2015, 1’19”) here. Photos reveal damage to Tell Newaaz in the western countryside of Aleppo, shared by Protect Syrian Archaeology (February 12 2015) here. A five minute video by Ismael Abed Alrahman shows damage to the Mamluk-era Bardebak Mosque/ Qastel Harami Mosque in Qastel Harami, Aleppo, shared by Protect Syrian Archaeology (February 9 2015) here. Video by Ismael Abed Alrahman shows damage to Al-Mouhtaseb Mosque, Aqyoul, Aleppo, shared by Protect Syrian Archaeology (February 7 2015, 2′ 43″) here. Images show damage to an Ottoman Police Station in Qastel Harami, Aleppo, shared by Protect Syrian Archaeology (February 6 2015) here. The DGAM reports (February 5 2015) that an explosion in Damascus, near the famous Souq al-Hamidiyeh, damaged the oldest of the twelve towers of the Damascus citadel. Information and two images can be found here. The DGAM reports (February 3 2015) damage in the region around Ras al-Ayn. This includes the theft of archaeological equipment and looting at Tall Fakhariye, the site of the Roman military base of Resaina. Other sites nearby have also been damaged. See the report with detailed photographs here. In addition, images shared by Protect Syrian Archaeology show illicit digging in the Byzantine tombs located in al-Nasiriyah and other villages, which can be found here. 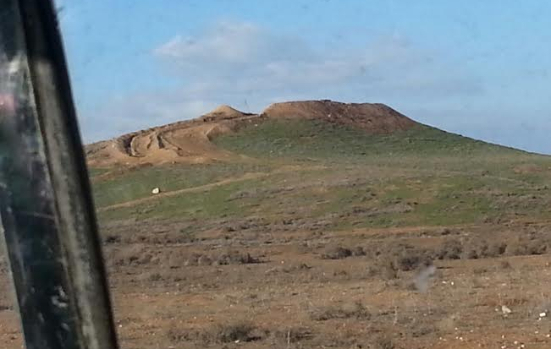 The DGAM reports that illegal digging has restarted at both Mari and Dura Europos. The work appears to have been carried out at the instigation of ISIL. The information on this story can be found here. 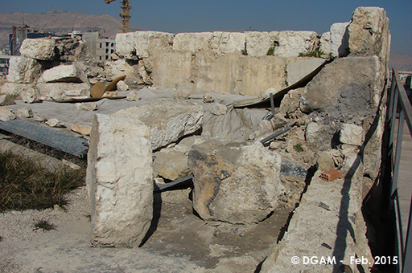 The DGAM (February 14 2015) has posted a useful interactive map of damaged sites in Syria. The map system ‘…allows users to access to the latest information and data on the damaged archaeological sites linked with their geographical dimension, type of damage, significant of the sites as well as photographs.’ The full explanation and link to the map can be found here. The DGAM (February 12 2015) welcomes UN resolution 2199, banning illegal antiquities trade from Syria, and thanks those contributing to the efforts. See the brief report here. The Syrian Minster of Culture held a symposium at the National Museum entitled ‘The Reality of Syrian Antiquities During the Crisis’, on February 8, 2015. The workshop will focus on the DGAM’s efforts to protect heritage during the ongoing civil war. See the report here. On February 12 2015, the UN Security Council adopted resolution 2199, designed to target ISIL’s financing. This includes a ban on the trade in Syrian antiquities removed after March 15, 2011. See the UN report here. For a brief commentary from Conflict Antquities blog, see here. The statement from UNESCO can be found here, and the statement from the US government here. ASOR gave another article reporting damage in Syria and Iraq up to February 9th, noting that the increased fighting in Damascus, Idlib, and Aleppo is harming heritage sites at an alarming rate. See the report here. A February 18 2015 article from The Independent asks who is buying the artefacts looted by ISIS. BBC Radio 4’s flagship investigative news program File on 4 discussed looting in Syria (February 17 2015) here. Marissa Fressenden writing for the Smithsonian Magazine asks, ‘Can antiquities looting in Syria be stopped?’ (February 15, 2015). An article (February 15 2015) from The Times Free Press warns that ISIS looting combined with civil war is destroying the heritage of both Syria and Iraq. On February 13 2015, Counterpunch asks ‘Is the Phoenix rising from the ashes in Syria?’, highlighting the work of local initiatives in protecting heritage sites. 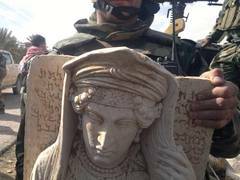 Illicit Cultural Property ran an article by Derek Fincham entitled ‘Increased attention on Syria’s heritage’ (February 11 2015). A podcast is available from Baruch College, entitled “Looting the Past, Destroying the Future: Revolution, Terrorism, and Archaeology in Egypt and Syria,” (February 9 2015) delivered by Professors Anna Boozer and Erin Thompson. A thought-provoking article from Counterpunch on February 4, 2015, asks ‘Who are the real culprits’ in Syria’s looting. The Conversation (February 3 2015) takes a broad look at the destruction of heritage sites, including those in Syria here. A post on the website of think-tank Chatham House by Sam Hardy and Sasan Aghlani discuss the policing of antiquities and the historic problem of looting here (on pdf).